Katie's blog, Blue Eyed Freckle, was one of the first sewing blogs that I fell in love with. She has a very individual style, which can be a hard thing to develop. She has great refashion ideas, backdrop ideas, and not to mention a fantastic etsy shop where she sells headbands. The first project I found of hers was the "I Wanna Be a Girl Scout" T-shirt revamp, featuring a fantastic collar, so I'm thrilled that she's sharing a faux collar project with us today! Hi everyone! I am Katie Kortman of blue-eyed freckle (blogger and esty-er). I am a mother of 2 (soon to be 3) and wife to a medical student and so.... I like to make it instead of buy it whenever possible. I don't usually do straight copies of the things I see and like, but rather use them as inspiration. Today's top is inspired by the collar of this dress I saw on thumbeline. I love a removable collar, but sometimes its easier to just make a faux one. 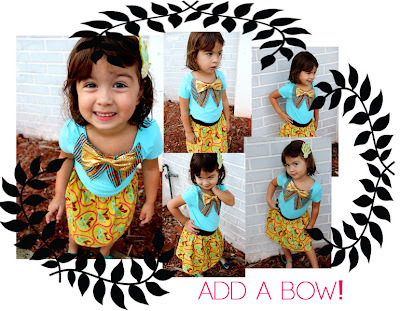 So if you are ready to jazz up your daughter's shirt in just a few simple steps, keep reading! 1. print the pattern and cut 4 pieces. Sew right sides together and make 2 collar pieces. Leave the top (straight) part open (don't sew). 2. turn the two collar pieces right side out and pin them to your shirt. Fold the unsewn part of the collar under, or inward so that it is closed shut as you top stitch the collar pieces to your shirt. 3. Cut 4 pieces of ribbon and top stitch on both long sides of the ribbon, making sure to tuck in the raw edges on the ends. For my older daughter's shirt, I decided it needed something more. So, I added a bow. You can follow my tutorial here if you are unsure how to make one. To apply it to the shirt, I just got out a hand needle and thread and tacked it in several places to ensure it won't get all wonky after being washed (which tends to happen). Here are a few more shirt-making or re-making tutorials from my blog. Happy Toptober! for boys/men, newborn girls/boys, pom-poms shirt, gathered collar shirt, ruffles and stripes t-shirt, the no-sew fringe shirt, book page shirt, easiest shirt from scratch, and my baby onesie applique ideas. Thanks again Katie. Great project. Look at those beautiful girls in their tops. Thanks for such nice words!!! I am proud to be featured on your blog!